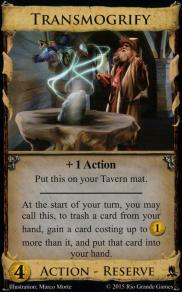 When you play this, put it on your Tavern mat. Directly after resolving an Action, you may call this, for +2 Actions. 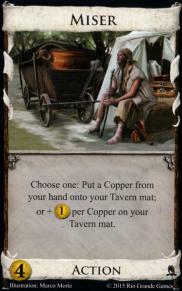 Choose one: Put a Copper from your hand onto your Tavern mat; or +1 Treasure per Copper on your Tavern mat. 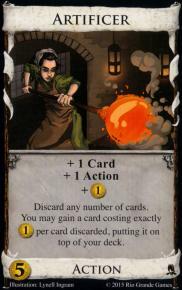 At the start of your turn, you may call this, to trash a card from your hand, gain a card costing up to 1 Treasure more than it, and put that card into your hand. 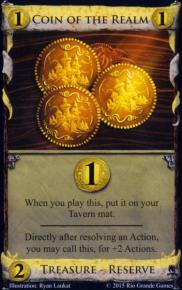 Each other player takes his -1 Treasure token. on your turns, but not less that 0 Treasure. 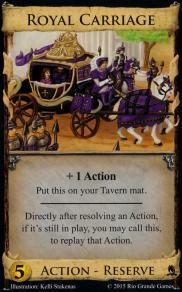 Directly after resolving an Action, if it's still in play, you may call this, to replay that Action. 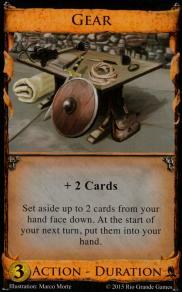 Set aside up to 2 cards from your hand face down. 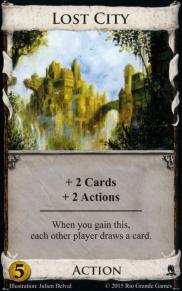 At the start of your next turn, put them into your hand. 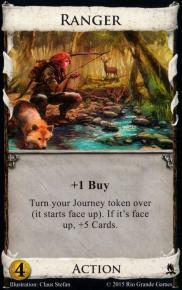 Turn your Journey token over (it starts face up). Of it's face up, +5 Cards. 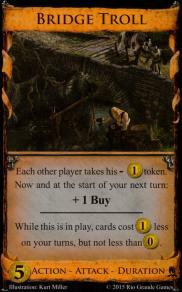 When you gain this, each other player draws a card. 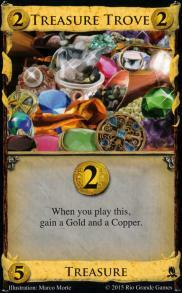 When you play this, gain a Gold and a Copper.